The sequel to the most popular physics-based game gets bigger, better and birdier! This time the pigs are meaner than ever! 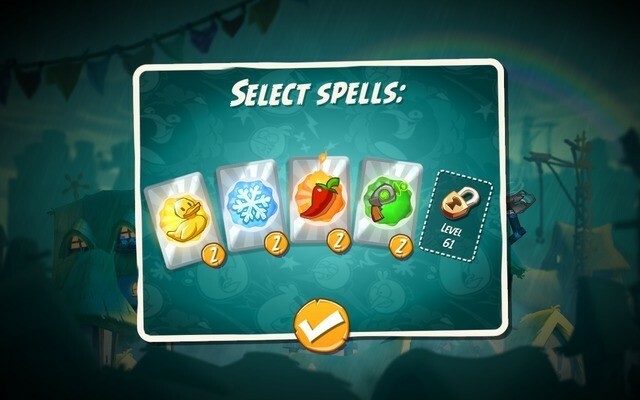 Angry Birds 2 sticks to the same old gameplay mechanics, but sprinkles new features, including the slick Destructometer, spell and card system. Fans will instantly fall in love with the drop-dead gorgeous graphics. Cel-shaded visuals bring characters and castles alive on beautiful landscapes. Levels are randomly-generated. No two stages will be the same. High replay value, beautiful graphics and immersive gameplay are some of the key features of this game. Most players will be familiar with the gameplay, but a mini-walkthrough, tips and tricks will help them destroy buildings, score more and earn 2-3 stars in every level. Every shattered glass, broken plank and crushed rock fills up the Destructometer. But the meter needs to be filled up faster. Each level has more than one stage and you may run out of cards unless it fills up on time. Try to hit the bottom part of the structure. Use a bird that is powerful against a material that forms the base of a piggy structure. Most structures are fragile and can fall down easily if a bird hits a delicate spot. The Birdie Guide below will show you which bird is powerful against glass, wood and stone and provides some tips to use their ability to the fullest. Remember that a structure must fall down so that each material breaks and this will fill the meter faster. Golden pigs can fill up the Destructometer completely, so your first priority should that part of a structure that contains a golden pig. In most levels, there will be more than one structure. Some buildings will be placed on higher ground. Target them first. If a bird hits his target, chances are high that a structure will fall down crushing the smaller structure placed on lower ground. However, if the lower ground building has too many TNT crates, better target that first as some rock or wood may blast away and hit the adjacent structure. The Destructometer fills up a little bit when you complete a level’s stage. Make sure you use one bird to destroy maximum materials in a structure. 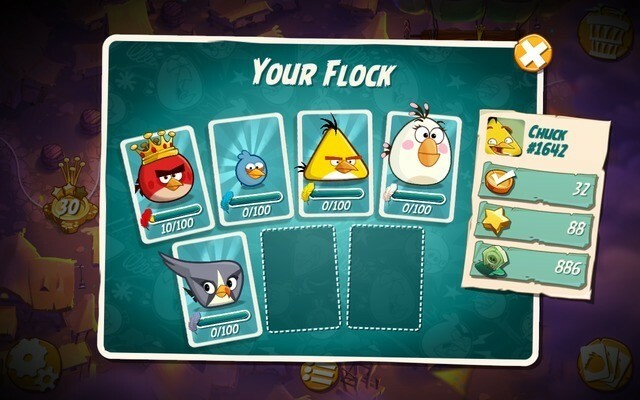 As you progress through each level, you will unlock more birds, increasing your card count. Make sure you destroy all buildings with fewer birds. The meter fills up faster if all structures fall down. Use a bird’s special abilities to destroy them completely. Look for objects that assist a bird’s speed and direction. Objects such as big fans, Venus flytraps can help your birdies reach their target faster. These little mischievous birdies can crush glass blocks, but will fall flat if they hit stones and wooden planks. They are probably the weakest of all birds, but if you find a structure with a glass base, use them first. Tap on the screen when they are close to the target for a triple attack, but avoid tapping when they are too close to their target. Timing is important if you want to inflict maximum damage with The Blues. His war cry can topple even the strongest castles. Use him against castles with a weaker base or taller structures (tall buildings fall easily with a single blow). Tap on the screen when you are close to your target to make it come crashing down. Chuck can crush wood and thin glass slabs (but not blocks). He is stronger than The Blues but can’t destroy rocks. Tap on him when he gets near his target to increase his speed. Make sure he isn’t too close to his target when tapping. He is big, furry and dangerous. Just launch him (make sure the trajectory is perfect), sit and watch him destroy everything that comes his way. He may not have any special ability, but he can be extremely useful against rocky and wooden structures. New birdie on the block! She can destroy rocks in her own unique way. Tap on the screen when Silver is flying over a castle. She will make a circle and come crashing down on her enemies, destroying everything (stone, wood, ice) that comes on her way. Make sure you launch her up into the sky and tap on the screen to inflict maximum damage to a building. Another birdie that can blow rocks (and possibly every material); Bomb can be quite effective against all structures. Just launch the bird and let it reach its target. He will detonate and destroy anything close to him. Make sure he lands close to TNT crates for massive destruction. The bird also explodes when you tap on the screen. Tap when it’s close to a flying pig or someone perched high up in the air. The white bird can destroy a castle with her egg. The harmless-looking projectile can wreck everything – rocks, wood, glass blocks, pigs – you name it. Make sure to tap on the screen when Matilda is over a castle. Tap to deploy an egg on castles on low ground or use her to target castles placed on higher ground. Spells can make piggy destruction easier, but you will have limited number of spells. Save them for tougher levels – those that appear before the boss level on the map. Spend gems after using the free quota. Launch and watch ducks rain down heavy on every structure. Cuteness overload! But extremely devastating for the poor piggies. Use it on structures that can’t be destroyed by birds. Turns blocks into ice. Use it against rocky structures – buildings that are made out of rocks. Make sure you launch the blizzard first to turn them into ice and then launch a Red bird, Chuck or The Blues to destroy them. Piggies burst into flames and destroy their castle. Can be a great weapon against rocky structures or buildings where it’s harder to kill all pigs (including the flying ones). Launch this spell to make all pigs grow bigger until they pop. Brilliant animation I must say. Love seeing them inflate and burst. Use the Pig Inflater when the pigs can’t be reached with regular birds. Connect to Facebook to get 70 gems. You also receive rewards for sending gifts, so make sure you hit and collect gift boxes that appear on some levels, connect to Facebook and send a gift to a friend. You get 10 gems for a gift you send to your friend. Complete daily quests to earn them. 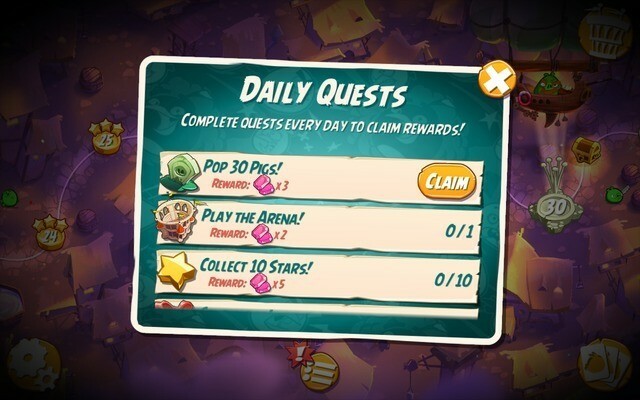 These quests could be anything from collecting stars to popping pigs to playing the Arena. The game notifies you about the quests you have completed. A notification icon appears at the bottom of the screen in map mode. Tap on the notification and then tap on claim to collect them. Login daily to earn gems. You can double the value by watching a video. Look at the video icon on the “Daily Gift” box and tap on it. Watch a video to double your reward. Make sure you are connected to the Internet. 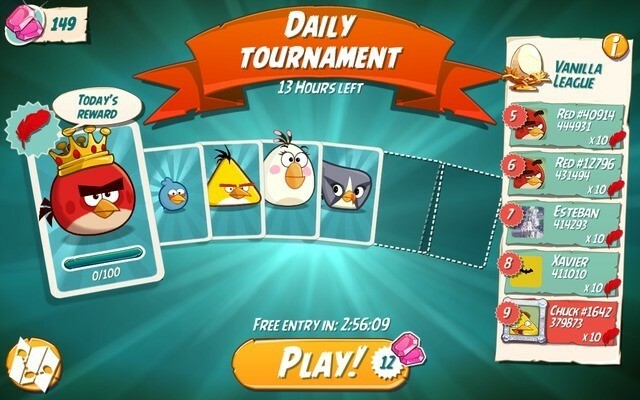 The game offers an “Early Bird” prize at the start of play. After downloading and installing the game, complete the first chapter before 13 days to get 40 free gems plus other gifts. Chances of earning an extra card are higher if a player reaches the last stage (especially if it’s a two or 3 stage level). Tap on the video link to watch a video. However, there are times when the video link appears randomly, even if you are on the second of third stage of a level. When your life counter hits zero go to map and tap on the heart icon located at the top right corner of the screen. Tap on the Play icon to watch a video and get one life free. You may wait until there’s only one minute left for a refill. Once the timer count downs to 30 seconds, tap on the play icon to watch a video. Soon you will receive two lives – one as a refill and another as reward. 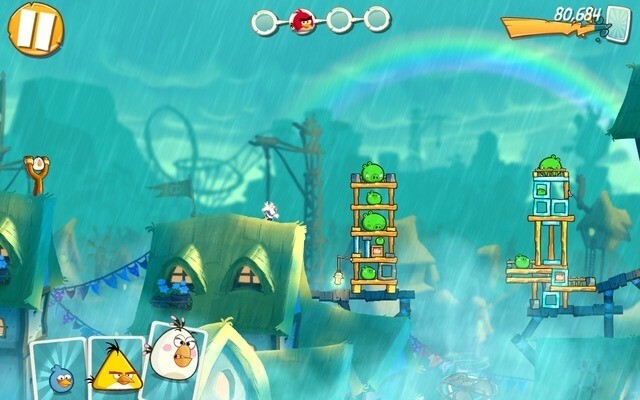 Angry Birds 2’s Arena mode lets you play tournaments, rake in as much points as possible and race your way to the top 10 on the online leaderboard. You will compete with players around the world for feathers and score points by destroying as many structures as possible with a party of birds unlocked in the single-player mode. The arena has different leagues and each league has an endless level (a level with infinite number of stages). You will have to score as many points as possible by playing the level. You can use all birds unlocked in the main game. Use a bird most suited for a stage. For example, if the structure is built by rocks and wooden planks, and if you have the red and white bird cards, then try to use any one of them. You get a free ticket every 3-4 hours. You may spend gems, but a better option would be to watch a video for a free entry if you want a quick pass to a tournament. It becomes difficult to beat stages after the third stage. The first 3 stages are pretty easy to beat and you may need only one bird per stage. There’s also the Destructometer, so make sure you hit a building’s base or a weaker spot and let the structure fall down so that each material breaks into pieces. This will fill up the meter faster.